I hesitate to make comments about political issues where I am fully aware of my ignorance. But, here’s a thing I’ve been thinking a bit about, like everyone else lately, which is gun laws and gun crime, especially from a Christian perspective. It seems to me that a lot of what I see defending people’s right to own guns, and especially the arguments about bringing more guns into situations like schools, is based on a false doctrine of sin. It’s because we think that there are ‘good guys’ and ‘bad guys’. And if the bad guys have guns, we need the good guys to have them too, to protect. The problem is that we do not live in a superhero movie. We live in a world where everyone is the bad guy. Where, given the right motivation and circumstance, all of us have the potential to act as monsters. Of course there are plenty of gun owners who have never used their weapons inappropriately. And there are plenty who have. When they were drunk. When they were angry. When they were scared. When they became mentally unstable for a time. When they felt they were owed something by the world. When they thought someone else deserved what was coming to them. When they wanted to take the law into their own hands. If we think we are not capable of inflicting harm on other people, we need to examine ourselves a lot more carefully. If we think we can distinguish people who are safe to own a gun from those who are not, we need to look again at how badly that’s working. If we think that gun ownership is not related to gun crime, we need to read the statistics. I remember when we had school shootings in the UK too. I remember that everyone was agreed that it must never happen again. So they didn’t just take guns away from ‘bad guys’. They took guns (certain kinds of guns) away from everyone. You can still own a gun to shoot rabbits on a farm. You can still go to ranges for target practice. But you can’t have a handgun at home and you certainly can’t own an assault rifle. Because we don’t know who the bad guys are. They are all of us. They are me and they are you. My year in pdf form. 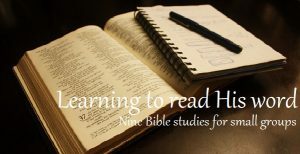 Nine Bible studies for small groups, including very detailed leaders’ notes. Four Bible studies for small groups on the book of Jonah, including notes for leaders. Thirteen Bible studies for small groups on Exodus 25-40, including detailed leaders’ notes.